Indomitable | The online home of Chauncey DeVega: Real Freedom is Black Folks in Surprising Places: Introducing the Black Outlaw Motorcycle Clubs the "Chosen Few" and the "East Bay Dragons"
Real Freedom is Black Folks in Surprising Places: Introducing the Black Outlaw Motorcycle Clubs the "Chosen Few" and the "East Bay Dragons"
Freedom is the ability to freely associate and communicate with those of your choosing. Freedom is also the ability to be free from harassment. Freedom is the the opportunity to live and be happy, where your rights and liberties as a full citizen are respected and honored without question. Following the Trayvon Martin case, the public dialogue that transpired in its aftermath, and also in talking to my students, most of whom are white, it has become readily apparent to me that our recurring and moribund "national conversation on race"--especially in regards to racial profiling, the extra-judicial murder of people of color, and the criminal justice system--is at its root one about basic conceptions of freedom. While much has been written about the great divides in public opinion regarding how White America and Black America perceive the fairness of the criminal justice system and the legitimacy of George Zimmerman's acquittal for killing Trayvon Martin, much less has been written about how public opinion in these matters is a function of both individual life experiences and historical memory. An example here is very useful. A few months ago, I was talking to some of my white students about the George Zimmerman trial. One of them very honestly stated that if Trayvon Martin had just been polite and submissive to George Zimmerman none of the events that evening would have transpired. Of course, I pointed out that George Zimmerman is not a police officer. I then, much to this student's surprise, highlighted how Trayvon Martin had no obligation to submit, answer questions from, respond to, or even be polite to a random stranger who was interrogating him. Moreover, I told this same student, that if I were in Trayvon's position, exercising my Constitutional right to walk down the street, I would have used some very direct language regarding Zimmerman, his mother, and what he should with her. I will leave the details to your imagination. As we talked some more it occurred to me that this young white man, a nice guy, one who is a product of American society and all of its unstated but taken for granted rules about white authority over people of color, never imagined that a black man would stand up for himself. When I asked him "what would you do if a stranger was harassing you and demanding to know the hows and whys of your choice to walk down the street?" his answer was pretty close to my own. Why then did his answer change when it applied to Trayvon Martin? I was taught that as a black man I must not sacrifice my dignity or self-respect to random white people or those who are allied with white racism in conducting my life. In dealing with the police, or those others with State authority to kill me, there are other strategies to be deployed. But I will not, under most or any other imaginable circumstance, surrender to a random person wondering about my legitimacy to be in a given public space. If you are not taught those lessons in the context of what it means to be black in America, I am unsure if it is possible to communicate the power and salience of that prime directive. For centuries, Black Americans have been subjected to rules limiting our freedom of movement. Slavery and Jim and Jane Crow were prefaced on that fact. Slave passes limited the freedom of black people in their own communities. The police and others, using debt peonage and terrorist groups such as the KKK, limited the mobility of African-Americans in an updated version of the plantation system during Jim Crow. Sundown towns, red lining, restrictive housing covenants, and other manipulations of the housing market also limited the mobility of African-Americans and our freedom. Consequently, there are many reasons for African-Americans' historic embrace of automobiles and motorcycles. Ultimately, the car and other means of travel were ways for black people to escape Jim and Jane Crow by finding the relative freedom of the road (even when we still had to come up with our own self-help and guidebooks for navigating it). Freedom is also the liberty to be who you want to be, to fulfill your own dreams, and to defy the unfair expectations forced upon you by the colorline. There are many millions of ways to be black in America; the politics of racial authenticity as internally policed and contoured by the realities of white supremacy and white racism, have also shaped how so many black and brown folks think about the boundaries and limitations of their own human possibilities. There are so many untold stories about black people who were in places "they did not belong", were not welcome, and who showed up unexpectedly much to the surprise of those whites folks who chose to greet and welcome them (or not). The Black Freedom Struggle is not just one centered on public marches by the thousands, or great men and great women who we honor for one month out of the year. Like other groups who have been marginalized in any society, there are and were day to day struggles, by real people, who just wanted to be free in the most basic sense of the word, who were also an integral part of the broader civil rights project. I am so fascinated by those black and brown folks that show up in inconvenient places because I count "ghetto nerds" like myself among that group. In learning that history, I am discovering so much about the history of Black America, the Black Diaspora, and their relationship to quotidian struggles for freedom and human dignity. The freedom of the road and travel that compels the devotees to motorcycle culture is universal across divides of race, class, gender, sexuality, and ethnicity. For African-Americans, a people who were denied such freedoms by law, it makes sense that we would find motorcycle and car culture especially compelling. I love learning new things. 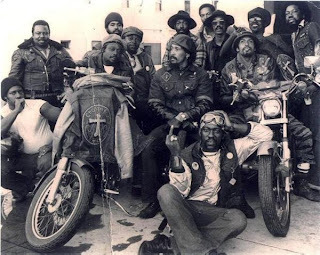 If you have any resources, stories, or other information to share about black motorcycle culture, and that of other people of color (and their white brothers and sisters) who are part of it do share. 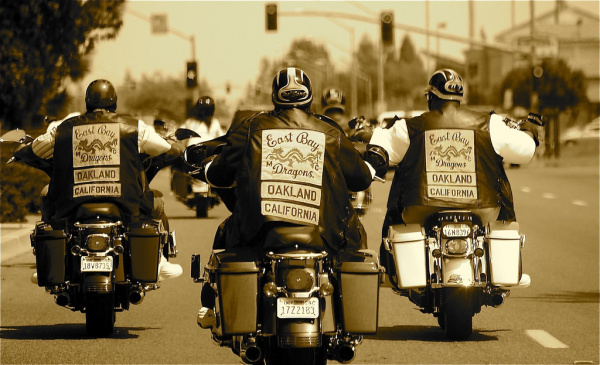 The brothers in the Chosen Few, the East Bay Dragons, and other pioneers in black and multiracial outlaw motorcycle culture constitute an American story that deserves and needs to be told to and shared among a larger public. That's alright. It would've been odd if there weren't any Black biker gangs. I'm annoyed that Black folks are seen so limited. Like when some say Obama's not really Black due to his background. Every Black military dependent has a story like Obama's. Black military dependents would be something else to highlight. I expect a little diversity when dealing with over 40 million people from different parts of the world. We have some skateboarders and martial artists out there, too. Good idea for a book series would be Black Folks Doing Something Different. 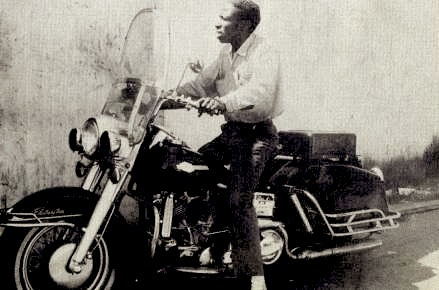 For a lot of conversations & resources on this subject, do a search for 'Robert Frank Black Motorcyclists'. This refers to the Swiss emigre photographer's picture of a pair of black Americans on a bike: "Indianapolis, 1956" in his ground breaking book "The Americans", published in Paris in 1958 and a year later in New York. Cool. Thanks so much for the lead. Absolutely. Or for a documentary, one of which I know is in the works by the way. how we willfully limit ourselves and shrink our world. I can remember a few times when I was surprised to see black people in certain places, back when I was much younger & only just getting up & out into the world. I still remember the first black university mathematics professor I ever saw, for instance. Your mind would have been totally blown, had you run into Air Force General (Chappy) James. Former Commander of NORAD ,back in the 1970's. Great man. Random, I am related, by a few cousins, to General Benjamin Davis. We live in small worlds. Some of us, smaller than others. Very proud and strong family line, you have. I was very honored to have served under Gen. James, back then so few of us were skilled operators and technicians of surveillance radar systems. We took flack from White and surprisingly Black service members, at most bases we were assigned to. Guess, we were to "uppity'' for them. I am familiar with some of his story, especially how he faced down a young Muammar Qaddafi at Wheelus Air Force base, Libya, in 1969. His patriotism was inspiring.